These books specifically address critical thinking. Andolina, Michael. Practical Guide to Critical Thinking. Albany, NY: Delmar, 2001. Print. 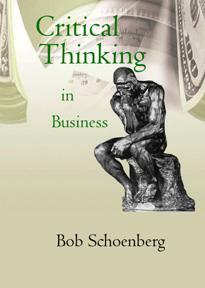 This is a combination textbook/workbook that focuses primarily on critical thinking in business and management decision-making. There is too much work on jargon and understanding the definition of words that will not actually be used in the workplace. Not enough review, repetition, or scaffolding of skills learned. Each skill is practiced little and no depth is provided. A few interesting observations are provided. 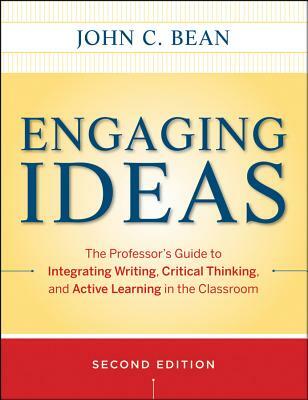 Bean, John C. Engaging Ideas: The Professor’s Guide to Integrating Writing, Critical Thinking, and Active Learning in the Classroom, 2nd ed.. San Francisco: Jossey-Bass, 2011. Print. A university text that offers practical thoughts on teaching strategies. “The goal of [writing-across-the-curriculum and critical thinking] is to transform students form passive to active learners” (xi) is his premise. Writing is the mode of expression of thought for the student. Includes an excellent chapter on how writing is essential to critical thinking along with pithy aphorisms that cut to the chase on teaching and teaching strategies. Brookfield, Stephen D. Teaching for Critical Thinking: Tools and Techniques to Help Students Question Their Assumptions. San Francisco: Jossey-Bass, 2012. Print. Browne, M. Neil and Stuart M. Keeley. Asking the Right Questions: A Guide to Critical Thinking, 11th ed. Upper Saddle River: Prentice Hall, 2014. Print. Chaffee, John. Thinking Critically, 10th ed. Boston: Houghton Mifflin, 2011. Print. 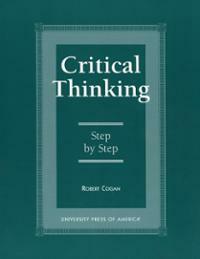 A critical thinking text for college, the book addresses thinking in general areas: solving problems, perceptions, believing and knowing, language and thought, concepts, inferring, arguments, philosophical reasoning, and relationships. There are excellent excerpts of texts and images to critique. Definitely a practical book. This is a discipline-specific approach rather than a generalizable approach. Cogan, Robert. Critical Thinking: Step by Step. Lanham: University Press of America, Inc., 1998. Print. Cogan gives a strict logical approach to critical thinking (syllogisms, etc. ), with a chapter on evaluating unsupported beliefs that vilifies religion. Of use for learning formal logic, but not of much use for general reasoning necessary in the classroom. Facione, Peter A. Critical Thinking: A Statement of Expert Consensus for Purposes of Educational Assessment and Instruction. Executive Summary. Millbrae, CA: The California Academic Press, 1990. Web. This report defined critical thinking as: “Purposeful, self-regulatory judgment which results in interpretation, analysis, evaluation, and inference, as well as explanation of the evidential, conceptual, methodological, criteriological, or contextual considerations upon which that judgment is based.” It recommended that critical thinking be a part of a good liberal education for all students and the group realized that this would not be easy to accomplish. Fisher, Alec. 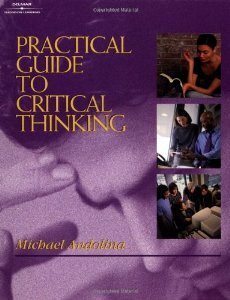 Critical Thinking: An Introduction, 2nd ed. Cambridge: Cambridge University Press, 2011. Print. This is a book intended as a stand-alone critical thinking course or one section of a course. Each chapter introduces a critical thinking concept and then provides exercises for exploration of the concepts. The answers to the exercises are provided in the back. Fisher notes that the book is not discipline specific and he aims for the skills taught to be “transferred to other studies and to everyday life” (n.p.). Critical thinking concepts are presented along with passages for practice. Of note is an excellent appendix of passages from which to form questions. Hale, Enoch. A Critical Analysis of Richard Paul’s Substantive Trans-Disciplinary Conception of Critical Thinking. PhD diss, Union Institute & University, 2008. Print. Hale’s dissertation contains an excellent description of critical thought, its history, types, and definitions, along with the practical epistemology of Richard Paul’s framework. Of special note is Hale’s argument that Paul’s framework is trans-disciplinary and non-procedural. hooks, bell. Teaching Critical Thinking: Practical Wisdom. New York: Routledge, 2010. Print. 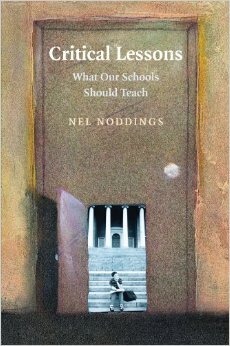 The author addresses the need for critical thinking through the lens of critical pedagogy. hooks reflects on teaching as an act of social justice and the need for the instructor to educate for freedom through engaged pedagogy. Of importance is her focus on the needs of the students and strategies that can foster freedom in the classroom. Intersegmental Committee of the Academic Senates of the California Community Colleges, The California State University, and the University of California. Academic Literacy: A Statement of Competencies Expected of Students Entering California’s Public College and Universities. 2002. Print. Liu, K. (2006). “Annotation as an Index to Critical Writing.” Urban Education, Vol. 41 No. 2, March 2006 192-207. Web. Moore, Betsy and Todd Stanley. Critical Thinking and Formative Assessment: Increasing the Rigor in Your Classroom. Larchmont, NY: Eye on Education, Inc., 2010. Print. Moore and Stanley base their reasoning on Bloom’s taxonomy, specifically a new taxonomy that reads: Remembering, Understanding, Applying, Analyzing, Evaluating, and finally, Creating. They equate critical thinking with the higher levels of the taxonomy. However, the authors assert that the lower levels are not easier, but just as difficult to do well as the upper, which they find to be thinking outside the box (13). Of special importance are: analysis questions – relationships within the concept, synthesis questions – analyze then do something different with hit, and evaluation questions – defend opinions using criteria (41). Moore, Brooke Noel and Richard Parker. Critical Thinking, 10th ed. Boston: McGraw Hill, 2011. Print. This is a college/university text for a course in critical thinking. Uses case studies and discipline-specific examples. Rhetoric and rhetorical devices are explored, along with deductive, inductive, and casual arguments. Also addressed is reasoning in morality, law, and aesthetics. The book is gimmicky and definitely slanted liberal. Moseley, David and Vivienne Baumfield, Julian Elliott, Maggie Gregson, Steven Higgins, Jen Miller, Douglas P. Newton. Frameworks for Thinking: A Handbook for Teaching and Learning. Cambridge: Cambridge University Press, 2005. Print. 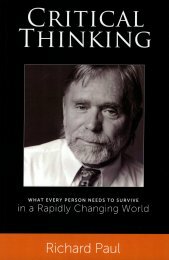 This text is a summation of frameworks that are used to address thinking. The introductory chapter is an excellent overview of what thinking is, including imagination, believing, reflection, and metacognition, along with sociological factors of thinking. Of interest are the chapters on Ennis, McPeck, the Delphi report, and Richard Paul. Most important is a section on thinking skills in education (24-25). Nelson, John. Cultivating Judgment: A Sourcebook for Teaching Critical Thinking Across theCurriculum. Stillwater, OK: New Forums, 2005. Print. After an introduction to critical thinking that touches upon the many concerns that researchers practitioners have found important (and some great quotes on thinking), Nelson presents fifty activities that he posits contain critical thinking for use in the university classroom. These include strategies for many disciplines, but principally for writing, his area of expertise. There is no overarching model of critical thinking upon which Nelson bases these activities, but they can be tied to Paul’s model. Noddings, Nell. Critical Lessons: What Our Schools Should Teach. Cambridge: Cambridge University Press, 2006. Print. Noddings discusses the need for controversial issues (and questions the need for advanced math). Her subversive views include how best to teach religion, motivation of students, when students should or should not do their best, and alternative study habits. Of note is the author’s discussion of critical thinking and its generalizability (33) and a as a habit of mind (34). “The people who insist that critical thinking is domain specific are probably not entirely right, but they have a point” (35). Nosich, Gerald. Learning to Think Things Through: A Guide to Critical Thinking, 4th ed. New York: Prentice Hall, 2012. Print. Nosich has taken the theories and strategies of Paul and Elder and made them accessible for secondary and college students. He defines each term, gives examples of each, and then strategies for employing them in the classroom and in life. It is written with a view to first understanding critical thinking in generalities followed by embedding them in a specific discipline. While aimed at the student, it has become a handbook for teachers who look for practical ways of teaching critical thinking that work.Across the Curriculum, 4th ed. Upper Saddle River: Prentice Hall, 2011. Print. Paul, Richard. Critical Thinking: What Every Person Needs to SUrvive in a Rapidly Changing World. Tomales, CA: Foundation for Critical Thinking, 2012. Print. A collection of Paul’s essays that cover what critical thinking is, how it can be taught, and how it can be embedded in disciplines. Of special note are his critiques of other educational philosophers and suggestions for staff development. Paul, Richard and Linda Elder. Critical Thinking: Tools for Taking Charge of Your Learning and Your Life, 3rd ed. Upper Saddle River: Prentice Hall, 2011. Print. This can be either used as a college text for a course on critical thinking or as a text for personal growth. The authors explain the parts of critical thinking and include exercises for practice in becoming a more reasoned thinker. Extremely helpful in understanding the nuances of the Paul/Elder framework and the exercises clarify how critical thinking can be improved for each individual. Paul, Richard, Linda Elder and Ted Bartel. California Teacher Preparation for Instruction in Critical Thinking. Dillon Beach, CA: Foundation for Critical Thinking, 1997. Print. Penaskovic, Richard. Critical Thinking and the Academic Study of Religion. Atlanta: Scholars Press, 1997. Print. 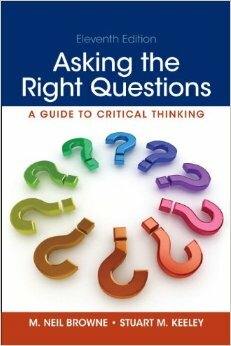 For teachers, this is a superb “how-to” book for practical strategies that support critical thinking. Included are making corrections, basic rules of writing, what to cover and n to cover, teaching thinking in religion, the problem with textbooks (they tend to define what we teach), throwaway facts, metaphors, and classroom thoughtfulness. Reali, Paul D. H2 [How to] Solve Wicked Problems: Getting Started with Creative Problem Solving. Charlotte, NC: OmniSkills Press, 2010. Reali defines wicked problems, those which might be ambiguous, have multiple solutions, or even unclear aspects to the problem. He then presents a model of problem solving based on the Osborn-Parnes CPS process. What is stressed constantly is the importance of using both divergent and convergent thinking. Reed, Jennifer H. Effect of a Model for Critical Thinking on Student Achievement in Primary Source Document Analysis and Interpretation, Argumentative Reasoning,, Critical Thinking Dispositions, and History Content in a Community College History Course. PhD diss. University of South Florida, 1998. Web. Schoenberg, Bob. Critical Thinking in Business. Chesterfield, Missouri: Heuristic Books, 2008. Print. The author is well-versed in Paul’s framework, and it shows. While some of it is business-specific, the sections on assumptions, point of view (he calls it frames of reference) and questions to probe critical thinking are excellent. Helpful in looking at certain aspects of critical thinking that might often be overlooked. Thayer-Bacon, Barbara. Transforming Critical Thinking. New York: Teachers College, Columbia University, 2000. Print. Of most interest is the comparison of Ennis (57) on critical thinking with McPeck (57), Paul (58), and Lipman (58). She notes that a strong aspect of Paul’s framework is to “look at issues form different perspectives and alternative points of view” (61). Watanabe, Ken. Problem Solving 101: A Simple Book for Smart People. New York: Penguin Group, 2009. Print. Watanabe’s simple book with cute illustrations is intended for young audiences, but includes so many tricks that the reader quickly becomes confused. There is not a cohesive formula for thinking, so the many diagrams and word problems quickly are difficult to reason through.